On a day with gold trading around $1,310 and stock markets almost universally in the red, the World Gold Council (WGC) issued its latest Gold Demand Trends quarterly report and it doesn’t make for great reading for gold investors. According to the WGC’s latest figures Q1 gold demand was the lowest for 10 years, primarily due to a fall in gold investment demand led by China, Germany and the USA – usually the principal investment demand centres. Altogether the WGC reckons that global bar and coin demand fell by 15% quarter on quarter and ETF inflows were softer too, although still positive at 32.4 tonnes. Compared with say 2015 and 2016 U.S. Mint coin sales have been pretty subdued for two years now and they won’t have been helped by the lacklustre performance of the gold price over the past month or so. Gold has remained range-bound mostly in the low $1,300s largely due to a sharp pick up in dollar strength as represented by the dollar index, which has risen around 4.5% from its low point this year – and gold is down a somewhat similar percentage from its high point of around $1,365 at the time of writing. The gold price is generally inversely related to U.S. dollar strength and this suggests the correlation is holding up well. The dollar appears to have turned down a little today and if this is the start of another downwards leg then the gold price could benefit accordingly. The WGC report is not wholly negative for gold. It does suggest that jewellery demand is holding up reasonably well with strength in China and the U.S. counterbalancing a decline in Indian jewellery demand, while industrial demand for the precious metal in the tech sector has seen six consecutive quarters of growth. So where does that leave us now? Equities are still looking nervous with falls almost across the board, bitcoin appears to be picking up a little with BTC back over $9,000 and Ethereum pushing up above 700, although we remain dubious about long term strength in crypto currencies. One commentator – I forget who – described bitcoin as like Candy Crush vouchers, or in other words has parallels to computer gaming, and we wouldn’t disagree seeing it crashing back to near zero as definitely a possibility – we shall see. If equities continue their weakness – and even at its current depressed level gold has outperformed th Dow and the S&P 500 so far this year. All are in negative territory so far but gold is only down around 0.75% whereas the DJIA is down over 4% since the beginning of the year and S&P 500 down over 3%. (By comparison bitcoin is down over 30% since the beginning of the year and over 50% from its heady peak.) In other words, year to date gold has done a better wealth protection job than U.S. equities and way better than bitcoin! Register at, or log on to, www.gold.org to download the full report. In its latest analysis, The World Gold Council concludes that bitcoin is no substitute for gold as a long term store of wealth – it is altogether too volatile. We have seen bitcoin collapse from close to $20,000 to below $10,000 at one stage and it seems to be trying to make a recovery, but could be stalling at current levels – still way too high in our opinion. A return to the rising pattern needs confidence in its growth potential and that will have been dented very severely. Despite anecdotal comments from well-regarded financial commentators that gold prices and gold demand are suffering at the expense of cryptocurrencies, there isn’t any quantifiable evidence that gold holdings are directly suffering from competition from cryptocurrencies. The weakness in physical demand in 2017 – for example, the paltry sales of US Eagles – is largely explained by the steady march higher of the S&P 500. Other established gold markets – such as China – saw healthy levels of demand. Overall, the level of the gold price in 2017 appears to be consistent with drivers of the past few years and is showing no signs of suffering from crypto-competition. At a high level, there are some similarities between the supply profile of gold and cryptocurrencies. The stock of bitcoins, for example, increases in number at a rate of approximately 4% per annum, and is engineered to slowly decline to zero growth around the year 2140. While gold can be mined without a date limit, its production rate has been quite small and steady. Approximately 3,200 tonnes of gold have been mined on average, each year, adding about 1.7% to the total stock of gold ever mined. Bitcoin’s future diminishing growth rate and ultimate finite quantity are clearly attractive attributes, as is gold’s scarcity and marginal annual growth. We recently published an article which drew quite heavily on research by Canada’s Murenbeeld & Co regarding headwinds ahead for gold – click on Gold facing severe headwinds despite overvalued dollar – Murenbeeld to read or re-read – and one suspects that Dr. Murenbeeld reached these conclusions in his research for his annual gold price predictions for the year ahead. These conclusions are usually the highlights of his early-year presentations at various events around the world. His new predictions for 2018 have just been published for subscribers to his economic service -see:www.murenbeeld.com – and as usual he presents three price scenarios for gold looking ahead to which he gives various weightings and uses these weighted averages (for worst, base and optimistic cases) to draw an almost final quarter by quarter gold price conclusion for the year ahead. But he again adjusts these figures further to take into account possible external geo-political events which are not considered in his initial price scenarios. The forecasts are all generally conservative and sometimes his overall predictions come close to eventuality. Other times they fall short on the positive or negative side, but seldom are they out by any significant amount. Thus Dr. Murenbeeld’s 2018 predictions, if they come about, will disappoint the gold bulls, but also confound the gold bears. He is very much on the middle path, although he thinks his more positive scenario is the one which should be followed by the world’s central bankers, but only gives this a 25% likelihood weighting. Q1: $1,281, Q2: $1,301, Q3: $1,329, Q4: $1,347. However he does say in his commentary that he would not be surprised if at some point during the year the $1,400 level might be breached intra-day, but obviously doesn’t anticipate that this level is sustainable. Looking beyond 2018 he also predicts gold averaging $1,351 in Q1 2019 and continuing to rise further to $1,368 in 2019 Q2. Bear in mind that these are all average prices and they thus could encompass some sharp fluctuations above and below the specified levels. As an example, in 2017 gold prices have fluctuated between around $1,149 and $1,351 with an average price of only $1,206 year to date. Meanwhile the World Gold Council (www.gold.org) has just published its latest Gold Investor publication in which its chief strategist, John Reade, is also optimistic on gold’s likely performance in 2018. He cites global monetary policy, a possible fall in the US dollar index, a switch from overpriced equities into precious metals, demand growth in China, India and other gold supportive markets like Germany, all as likely positives for gold. He makes no price forecasts but anticipates the gold price continuing to grow in the year ahead, but again at a pretty conservative rate. Neither of these stated reports suggest an on-fire gold price next year, but both are at least conservatively positive. Deep down we suspect things could move a little faster and gold end the year at $1,400 plus but that very much relies on those holders of the big shorts on the COMEX futures market allowing prices to rise faster than they have been allowed to in the current year and a turnaround in precious metals investment – in bullion in particular in the North American markets. Gold demand there may be dwarfed by that in the East, and even in Europe, but the U.S. markeyts in particular still seem to be setting the gold price. We hope for better things but aren’t holding our breath in anticipation. Germany’s gold investment market has boomed in the past 10 years. In the face of successive financial crises and loose monetary policy, German investors turned to gold to protect their wealth. In response, new product providers entered the market making it easier for people to invest. Last year, more than €6bn was ploughed into gold investment products in Germany and, encouragingly, there is room for further growth: consumer research indicates there is latent retail demand which the industry can tap into. Here’s what the World Gold Council reckons are the key takeaways from its new Gold Demand Trends report. As can be seen it reckons demand has slowed y-o-y but that’s entirely because of lower gold ETF demand in the first half. When reviewing these figures, and extrapolating them for the full year, it should be borne in mind that H2 2016 gold ETF demand fell back sharply too in comparison with H1 2016. Q2 gold demand of 953.4t was 10% lower than 2016, while H1 demand slowed 14% to 2,003.8t. Y-o-y comparisons are affected by record ETF inflows in 2016: demand from this sector slowed dramatically after last year’s H1 surge. Central bank net purchases of 176.7t were also slightly lower in the first half (-3%). By contrast, bar and coin investment improved, as did jewellery demand, although the latter remains weak in a long-term context. Technology demand also made modest gains. 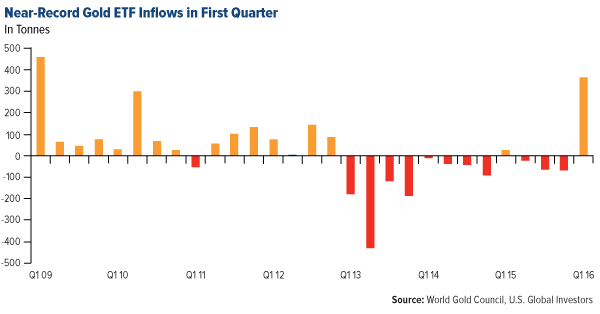 ETF inflows slowed dramatically from last year’s record pace. But holdings continued to grow: after adding 56t in Q2, H1 inflows reached 167.9t. European ETFs saw the strongest H1 inflows: holdings in these funds reached a record 977.7t. Bar and coin investment rebounded from very low levels.Q2 demand gained 13% from Q2 2016, while H1 demand rose 11%. A strong jump in Turkey was fuelled by economic recovery, double-digit inflation and relative currency stability. Jewellery demand strengthened from a weak 2016, but fell short of the long-term average. India was the main contributor to the 8% gain in Q2, as it recovered from extremely low 2016 demand. Central banks continued to buy, but at a more modest pace than in recent years. The most recent quarter saw Turkey’s central bank add to its gold reserves – the first significant purchase since the 1980s. Technology demand registered its third consecutive quarter of growth: up 2% to 81.3t. Growth in wireless charging and development of features that use LEDs boosted demand. New smartphone handsets supported chip production. The best performing precious metal this week was silver, down 1.82 percent. According to data from the Commerce Department on Thursday, orders for U.S. capital goods declined unexpectedly in April for a third straight month, reports Bloomberg. With American manufacturers continuing to pull back, this could indicate a lesser chance for the Federal Reserve to raise rates in June. The worst performing precious metal for the week was platinum, down 4.40 percent. Gold traders are bearish for a second week – the first successive week since mid-April – as bets increase on an interest rate move from the Fed, reports Bloomberg. The Fed Funds futures show the odds of a rate increase by July seen at 52 percent, up from 48 percent at the end of last week. Following a pause in the dollar’s rally this week, Bloomberg reports that gold snapped six days of losses, rebounding from the lowest level in seven weeks. The article continues, stating that gold is still headed for the biggest monthly drop since November on speculation the U.S. Federal Reserve will increase U.S. borrowing costs as early as next month, denting demand for bullion. As Venezuela’s economic crisis deepens and the government faces concerns that it could struggle to honor bond payments, the country held the biggest gold sale by a central bank in eight years, reports Bloomberg. According to data from the International Monetary Fund, Venezuela cut its gold reserves by 16 percent in the first quarter, following a 24 percent reduction in 2015. Deutsche Bank, in a recent note, says that by preparing markets for future interest rate hikes, the Federal Reserve potentially hampers its ability to actually carry out those hikes in the future, reports Business Insider. The article continues by stating, that said in another way, “The Fed appears stuck in a negative feedback loop wherein suggestions that higher rates are coming create the unsettled conditions that ultimately force the Fed to keep rates right where they are. UBS believes that gold is set to “roll over,” reports Bloomberg, forecasting bullion to drop back to $1,150 an ounce. The yellow metal could tumble as the U.S. dollar “erodes demand with the Federal Reserve opting for not one, but two rate increases before the year-end,” according to UBS Group AG’s wealth-management unit. Not everyone sees a retreat in gold however. Citigroup raised its year-end target by $100 to $1,250 an ounce, reports Bloomberg. In an interview with CNBC this week, Dennis Gartman cautioned investors on when he believes they should come off the sidelines for gold. He says the time to be bullish on gold is not until after the first interest rate hike of the year. Assuming that a rate increase will happen in 2016, he thinks investors should avoid the precious metal in the near term, as he expects an active market to remain after the central bank acts, reports CNBC. Retailers in Hong Kong are forecast to see the worst downturn in gold sales in at least 15 years, reports Bloomberg. Fewer mainland shoppers are spending less money on jewelry, the article continues, and China’s economic slowdown and anti-corruption campaigns have hurt luxury retailers in Hong Kong with visits by Chinese tourists. This year’s first quarter is one for the history books. Not only did gold appreciate at its fastest pace in 30 years, but demand for the yellow metal was the strongest it’s ever been on record. Let me repeat that: the strongest it has ever been. Demand surged 21 percent from the same period a year ago, according to the latest World Gold Council (WGC) report. Most of this demand was driven by investment, with net inflows into gold ETFs reaching 363.7 tonnes, a seven-year high. Meanwhile, demand for bars and coins shot up 55 percent year-over-year, from 11.8 tonnes to 18.3 tonnes. Appetite for American Eagle coins jumped 68 percent. Uncertainty over the world economy, not to mention central bank policy, continues to act as a major catalyst for demand, heating up the Fear Trade. With many countries currently locked in a global race to see who can devalue their currencies the fastest, investors are seeking better, more reliable stores of value, and gold is happy to oblige. This was the message shared by Wayne Allyn Root, the “Capitalist Evangelist,” whose presentation I had the pleasure to see at the MoneyShow last week in Las Vegas. The week before last I said I would be speaking at the event, which was founded in 1981 by my dear friend Kim Githler, and I had no idea how popular Root really was. 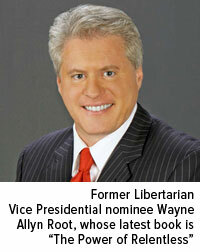 A businessman, politician and author, Root was the vice presidential candidate for the Libertarian party in 2008 and this year endorsed Donald Trump for president. At the MoneyShow, he packed the room with 1,400 people. Whole crowds turned out to hear him sermonize on entrepreneurship, individual rights and the importance of owning tangible assets such as precious metals and rare coins as a hedge against inflation and today’s uncertain financial markets. 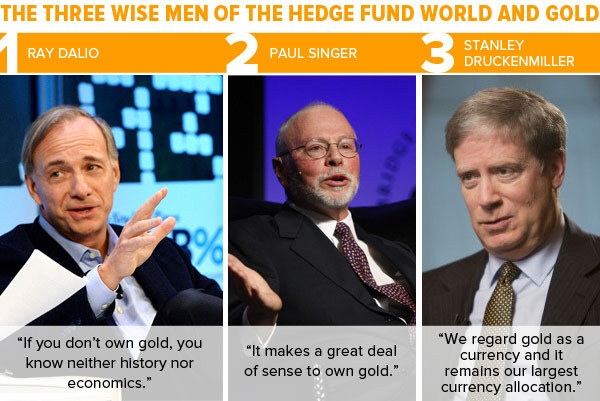 Owning gold, he said, is no longer a luxury but a necessity. One of Root’s most interesting data points is just how much purchasing power the dollar has lost since 1913, the year the Federal Reserve was created: A million dollars then is worth about $25,000 today. Gold, on the other hand, has not only held its value but appreciated. One million dollars in gold in 1913 would now be worth more than $60 million. Get educated on diversifying into gold! Another illuminating presentation I’d like to mention was conducted by IBD’s Amy Smith, who convincingly spoke on how the 2016 elections might change the stock market. The most actionable takeaway was that most blue chip stocks have typically done well no matter who occupies the White House, confirming my own attitude that, at the end of the day, it’s the policies that matter, not the party. The most compelling example she used was Netflix, whose stock has been a steady climber throughout both Bush 43 and Obama’s presidencies. A reasonable, well-positioned portfolio, then, consists of strong, entrepreneurial names; gold (I always recommend a 10 percent weighting: 5 percent in gold stocks, 5 percent in physical bullion); and short-term, tax-free municipal bonds, which have historically done well even in times of economic turmoil, such as the tech bubble and the financial crisis. About a third of global debt right now comes with a negative yield. Elsewhere in the letter, Singer suggested that gold’s phenomenal first quarter, in which the metal rose 16.5 percent, is “just the beginning.” Further loss of confidence in central bankers’ ability to jumpstart growth could take the metal even higher. Register Today for Our Next Gold Webcast! I invite all of you to register today for our next webcast, titled “All Eyes on Gold: What’s Attracting Investors to the Yellow Metal.” I’ll be discussing the chief factors driving gold demand right now, how historical and seasonal patterns affect gold and why the metal can be an integral part of your portfolio. The webcast will be held on June 8, starting at 4:15 PM Eastern time (3:15 PM Central time). This is an exciting time for gold. I hope you’ll join me! My latest article on sharpspixley.com. For 2014 for example, the WGC (whose figures seem to be taken as gospel by the world’s major media outlets) reported mainland Chinese gold consumption that year at 813.6 tonnes. The CGA yearbook stated the total Chinese gold demand figure at 2,106 tonnes – which is actually extremely close to the Shanghai Gold Exchange (SGE) withdrawals figure for the same year at 2,102 tonnes. (For 2013 CGA total demand figures were also almost identical to SGE withdrawal figures for that year.) Now while the categorisation of what should actually be included in the WGC consumer demand figure may differ somewhat from what is included in the CGA total demand figure, the 2014 difference of 1,292 tonnes between the two sources stretches belief. Either the WGC (using GFMS figures) got it hugely wrong, or the China Gold Association is including all kinds of things which the WGC isn’t in its calculations……. The World Gold Council has, for example, just reported the second highest ever quarterly central bank purchases (although to be honest this conclusion could be described as a little misleading as pointed out in the Sharps Pixley article linked above) and strong retail demand elsewhere. Meanwhile the Shanghai Gold Exchange has been reporting huge new record physical gold deliveriess (this year’s to date figure has already exceeded the full year SGE deliveries record of 2013 and already is some 366 tonnes higher than at exactly the same time in 2013. As we note in the article there are differences of opinion on the exact correlation between SGE deliveries and what is classified as Chinese gold demand – largley due to the classification of what actually comprises ‘demand’ or ‘consumption’ but as a like-for-like indicator of what is happening in China in comparison with prior years one cannot ignore the SGE statistics – and the mainstream analysts do not dispute that 2013 was the record year for Chinese gold consumption. And in terms of global gold consumption it is still China and India which between them hold the key. China is rebooting its economy but as was seen in the absolutely enormous recent ‘Singles Day’ (dwarfing those of the U.S.’s Black Friday and Cyber Monday put together – see Chinese Singles Day Sales Eclipse Black Friday And Cyber Monday Combined …) the purchasing power in the hands of China’s ever growing consuming classes is already absolutely huge and growing at perhaps 5-6% a year. There is also a propensity for buying gold so we are entering an era where Chinese gold purchasing alone will probably start to exceed total new supply. And Indian demand remains huge too – and again with a potential economic growth potential which greatly exceeds anything in the West. If the Modi Government can deliver on its promises, then demand growth here could start matching that of China – although the Indian intelligentsia have their doubts as to whether Modi is anything more than a consummate politician and thus a master of spin to match many of his Western counterparts! (This is being written from India and the comment comes from conversations with Indians from Modi’s own state of Rajasthan). However, how long gold prices can continue to move downwards under a massive, and ever-continuing, Sino-Indian growth scenario, remains the $64,000 question! The latest run of statistics from the World Gold Council has been released in the form of its Q2 Gold Demand Trends analysis with data nowadays being provided by London-based precious metals consultancy – Metals Focus. While it finds that global demand is down 12% year on year it notes that there is a good likelihood that demand will pick up well in the second half – indeed the latest gold price moves and figures for Indian imports and SGE withdrawals suggest that this may already be happening. On the Fundamentals front it also noted that supply was down 5% with an increase in mine supply being more than countered by a fall in gold scrap supplies. Central bank purchases were down year on year but still remained strong with the Q2 figure up on that for Q1. The World Gold Council’s Gold Demand Trends report for Q2 2015 shows total demand was 915 tonnes (t), a fall of 12% compared to the same period last year, due mainly to a decline in demand from consumers in India and China. However, demand in Europe and the US grew, driven by a mixture of increasingly confident jewellery buyers and strong demand for bars and coins. Looking ahead, there are encouraging signs moving into what are traditionally the busiest quarters for gold buying in India and China. Overall jewellery demand was down 14% to 513t, from 595t in 2014 due to falls in consumer spending in Asia. In China, slowing economic growth and a rallying stock market led to a 5% fall in demand to 174t. In India, the heavy unseasonal rains in Q1 and drought in Q2 impacted rural incomes and affected gold demand. In addition, a dearth of auspicious days for marriages in Q3 meant that wedding-related demand was unusually slow, leading to a fall in jewellery demand of 23% to 118t. Overall, if we look at the picture for the first half of this year in India, jewellery was down 3% to 268.8t from 276.1t (H1 2014). The US remained steady, with jewellery demand up for the sixth consecutive quarter by 2% (26t). In Europe demand was also up, with Germany up 7% and the UK and Spain both growing by 6%. Global investment demand was down 11% to 179t from 200t in Q2 2014. India was the main driver of the fall, down 30% to 37t, due to uncertain price expectations and a buoyant stock market. This was countered by a rise in Chinese bar and coin demand, up 6% to 42t. In Europe, fears of a potential Greek exit from the eurozone saw retail investment in gold reach 47t, a rise of 19% compared to last year. The US also saw strong demand, with retail investment increasing by 7%. Of particular note was the huge burst of activity in June, when bullion coin sales by the US Mint hit a 17-month high. Elsewhere, central banks continued to be strong buyers of gold. Net official sector purchases totalled 137t, with Russia and Kazakhstan the biggest purchasers. Although a year-on-year fall of 13%, buying increased by 11% when compared with the first quarter of this year. It is the 18th consecutive quarter where central banks were net purchasers of gold. Total supply was down 5% to 1,033t, as an increase in mine production of 3% to 787t in Q2 2015 was offset by declining recycling levels – down 8% to 251t. The indication for H2 2015 is that mine production will slow as the gold mining industry continues to manage their costs and optimise operations in the face of challenging markets. “It’s been a challenging market for gold this quarter, particularly in Asia, on the back of falls in India and China. The reverse is true for western jewellery markets, as increased economic confidence led to continued growth in consumer demand. It is fair to say that investment demand for the quarter remained muted given the continuing recovery in the US economy and booming stock markets in India and China during the quarter. Overall demand was down 12% in Q2 2015 to 915t compared to 1,038t in Q2 2014. Total consumer demand – made up of jewellery demand and coin and bar demand – totalled 715t, down 14% compared to Q2 2014. Global jewellery demand was 513t, down 14% compared to the same period last year, due to falls in China, down 5% to 174t, as well as India, down 23% to 118t. The US and Europe saw continued growth with the US up 2% to 26t, and Europe up 1% to 15t. Total investment demand was down 11% to 179t, compared to 200t in the same quarter the previous year. Demand for bars and coins saw a 15% drop to 201t from 238t the previous year, as the sector was affected by an expected increase in US interest rates and a continued shift towards other asset classes, notably equities. ETFs saw outflows totalling 23t, lower than the outflows of 38t seen in the same quarter last year. Central banks continued to be strong buyers of gold, accounting for 137t in Q2 2015, slightly down on the equivalent quarter last year, but up 11% compared to the previous quarter. It was the 18th consecutive quarter where central banks were net purchasers. Year-on-year quarterly mine production increased 3% to 787t in Q2 2015, against 763t in Q2 2014. Recycling levels were down 8% year-on-year to 251t compared to 273t in Q2 2014, resulting in total supply falling 5% to 1,033t. The Q2 2015 Gold Demand Trends report, which includes comprehensive data provided by Metals Focus, can be viewed athttp://www.gold.org/supply-and-demand/gold-demand-trendsand on our iOS and Android apps.. The first LBMA Gold Price benchmark price has come in at $1171.75, but the make-up of the price setting participants continues to raise questions. The new LBMA Gold Pricing benchmarking process came into effect today and the 10.30 am price set under the new system was $1171.75 – but the make-up of the initial direct participants in the new ‘fix’ is somewhat mired in controversy. Many had believed the number of direct participants would be expanded into double figures and include at least one Chinese bank – or possibly even three – among its numbers. In the event it appears that the direct participants in setting the LBMA Gold Price, as it is now called, comprise the four banks which were involved in the old London Gold Fix, plus two more only (Goldman Sachs and UBS) – and no sign of any Chinese involvement. In a prior article on Mineweb.com – I had commented that it was by no means certain that there would be any Chinese participation at the start – see: Fixing the Gold Fix – with or without the Chinese banks?, which obviously has proved correct. The fact that, in the event, by far the world’s biggest gold consumer – whatever the World Gold Council and GFMS may say in their analyses, which uses a very limiting definition of consumption – should not be involved in the new benchmarking process may well indeed be seen as a ‘fix’ in the worst connotations of that word in modern parlance. We do assume though that there will be sufficient pressure on the London Bullion Market Association (LBMA), which owns the intellectual property to the London benchmarking process, and ICE Benchmarking Administration (IBA), which is handling the mechanics of the process, to involve participation by one or more of the three Chinese banks which have expressed interest in being involved and would appear to meet the strict qualification terms imposed. These are the Industrial and Commercial Bank of China (ICBC), the Bank of China, and China Construction Bank. The first of these is the world’s largest bank in terms of assets and it seems to an outside observer that it is inconceivable that any true new gold price benchmarking system should not at least include the world’s biggest bank from the world’s largest gold consuming and producing nation. Outside observers may also well reckon the selection of the new process participants does indeed comprise a ‘Fix’ in order to try and maintain the status quo for as long as possible. Indeed the LBMA and IBA have been remarkably tight-lipped so far about the selection process for the new LBMA Gold Price participants, or even as to who was going to be the ‘chairman’ of the benchmark setting group (despite this being supposedly a fully electronic process). So why are no Chinese banks involved? Undoubtedly the LBMA/ICE will come up with some spurious technical reason which has so far delayed any Chinese inclusion and that they will be working towards some Chinese involvement – but exactly when this might occur will probably be unspecified. There may undoubtedly be a fear that once the Chinese banks are involved, the Western bullion banks which have set the London gold price benchmarks for nearly 100 years, will eventually lose control of the process and the Chinese will come to dominate it given the seemingly ever-growing demand for gold there and in other Asian nations and the huge physical gold flows from West to East.